Is our scholarship based on illegal foundations? Publishing used to be largely about dissemination – printing books and journals and shipping the copies to readers. This changed radically in the 21st century, where dissemination is virtually cost-free: Publishing is now primarily selection of content, plus the erecting of barriers to public access – at least if you are a commercial publisher. And this means that ways around these barriers will be sought by people who would like access to the content. The fate of the music industry since the 1990s is well-known, and this may have affected not only the bosses, but sadly also the artists. Nobody would argue that professional artists and writers should give their content away for free, but in this post I only talk about scientific content. My question is: To what extent are the current scholarly dissemination practices legal? In the official picture, libraries acquire access rights from commercial publishers, or individual scholars deposit their green open access papers in their institutional repositories. Both of these happen a lot of the time – especially the libraries of rich institutions pay huge sums to the commercial publishers. But at least in my field, institutional repositories are still fairly marginal, and what people do instead is put their papers on their personal websites, or use Academia.edu as a repository for their papers. And since Academia.edu is not vetted systematically, I suspect that it contains a large number of papers that the publishers do not officially allow to be uploaded. Some publishers have asked Academia.edu to take down papers whose rights they own, but this results in negative publicity, so it is my strong impression that most publishers just say nothing and hope that their revenues will not be affected too much too soon by the practices of the scholars. I know of no research about the extent to which Academia.edu contains content that infringes the copyright owners’ rights, and maybe I am exaggerating. But the prevalent attitude among scholars seems to be: Let’s make use of whatever ways of disseminating our results we have, and let others worry about the rights management and the costs. Critical voices about Academia.edu are rare (an example is a recent post by historian G. Geltner, which focuses on future plans for monetizing Academia.edu). In my experience, while scholars have little qualms about uploading their papers, they rarely upload PDFs of books. But for books, there are a number of “text-sharing platforms” which seem to be widely used, especially by younger scholars (see, e.g., this recent paper). I have no idea where these platforms get their content from. I do not have any legal expertise, but to all appearances these websites share books in a way that infringes the rights of the commercial publishers, because usually the publishers insist on copyright transfer from the authors. I learned about these text-sharing platforms only in the spring of 2015 (though I had heard rumours about them earlier) – as a member of a rich science institution, my colleagues and I have no particular need for them, and there is almost no public discourse about them. Scholarly associations do not discuss them, and the social media are silent about them. So does this mean that they are marginal and few people use them? This seems very unlikely, given that they contain a large number of recent scientific books (and articles) which are otherwise difficult to get, especially if you don’t have the fortune to work at a rich institution. Thus, it is my impression that to a growing extent, our scholarship may be based on illegal downloads of copyrighted material. Is this a big problem? Since scientists are not being prosecuted in large numbers (and the case of Aaron Swartz is fortunately an isolated case), one might answer that it isn’t a big problem, and that we as scholars should just go on doing what we are supposed to do, letting others take care of the legal and financial framework of publication. Personally, I find it difficult to go along with this. I think that the well-being of a society to a large extent depends on the trust that is established by widely respected legal frameworks. If scientists disregard the law in ever larger numbers, this cannot be good for science or for the society. – Recognize that scientific publication is part of scientific research and needs to be funded in the same way. – Create incentives to abandon privately-owned brand names, e.g. by proper funding of scholar-owned brand names. You would think that Elsevier makes so much money from selling reference works like the Encyclopedia of Language and Linguistics (2006, print: 3949€, 9000 pages) that they could pay a typesetter. No! What they did is obvious when you look at the formatting of the figures and formulae. 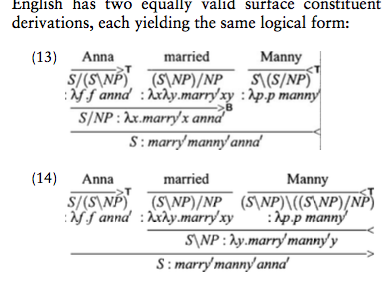 They just did a screenshot (of a manuscript perfectly typeset in LaTeX). As you can see the derivation in (13) has a little vertical line at the right edge. An artefact due to inserting screenshots. So the claim that publishers like Elsevier do high quality typesetting for us is a myth going back to the good old times. It is not reality. And the fact that the little line is still there somehow is evidence that the inhouse proofreading did not work either. This is the paper, just in case you want to check. It is $30 for 12 pages = $2,50 per page. After getting more and more SPAM from journals, I decided to put together a list of journals that send me unsolicited mail and usually demonstrating a real lack of understanding of the field they claim to publish in. The first member of the list will be Journal of Modern Education Review (ISSN 2155-7993). They asked me whether I want to submit my paper about CoreGram in their journal on Education and if I wanted to publish books with them. The paper is already published. I am one of the press directors of Language Science Press and I am not looking for an outlet for my books. So, this is a clear candidate for a SPAM journal. I emailed our librarian and asked them whether it would be possible to cancel the Lingua description. She informed me that they canceled the print subscription long time ago and that the online version cannot be canceled since the FU has a contract until 2017 that was set up for all Berlin universities. These bundles make individual cancellations impossible. One option that was considered by the FU was to not enter new contracts with Elsevier at all, but the sciences rejected this option. Conclusion: We keep Zombie Lingua in our library and have to talk to the sciences and convince them that it is worthwhile to transform their journals into fair OA. Three years ago I wrote a blog post asking whether we should follow the mathematicians and just stop working for the major publishers. I argued that this would be difficult since the field sort of needed the journals. Since then I reviewed for Lingua four times. With the recent developments and the complete board of Lingua stepping down and leaving Elsevier and founding the new journal Glossa, there is no reason for me left to work for Elsevier after the current editors fulfilled their duty at the end of the year. The other journals are outside of my field of specialization and therefore I now say: Goodbye, Elsevier! and add to my signature in the Cost of Knowledge petition that I will never submit to nor review for an Elsevier journal during the rest of my life.